It is now six months since we arrived in Shepshed, and we are glad God called us here. 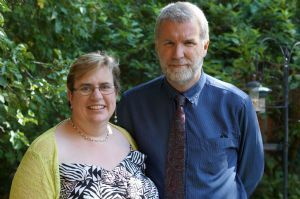 Having worked as a secondary school teacher for most of my career, interspersed with some time as a driving instructor and HGV driver, I began training for ministry in 2009, and have pastored churches in Sussex and Teesside. Margaret and I love music, spending time away in our caravan, and have recently welcomed our greyhound, Pumpkin, to life in the manse. God continues to bless richly our four sons: Jonathan works in Manchester, Stuart is at Belfast Bible College and gets married in June, Alex is currently working in Ashby, and Ben is enjoying life at Lancaster University.